Hello everyone and welcome back to The BBQ Buddha! This post features a recipe I made last month for a local EGGFest at Brownsboro Hardware here in Louisville, KY. This is an easy and delicious appetizer to make on your Big Green Egg. My friends at Dizzy Pig were kind enough to sponsor me for this event and this was my favorite recipe using one of their rubs. 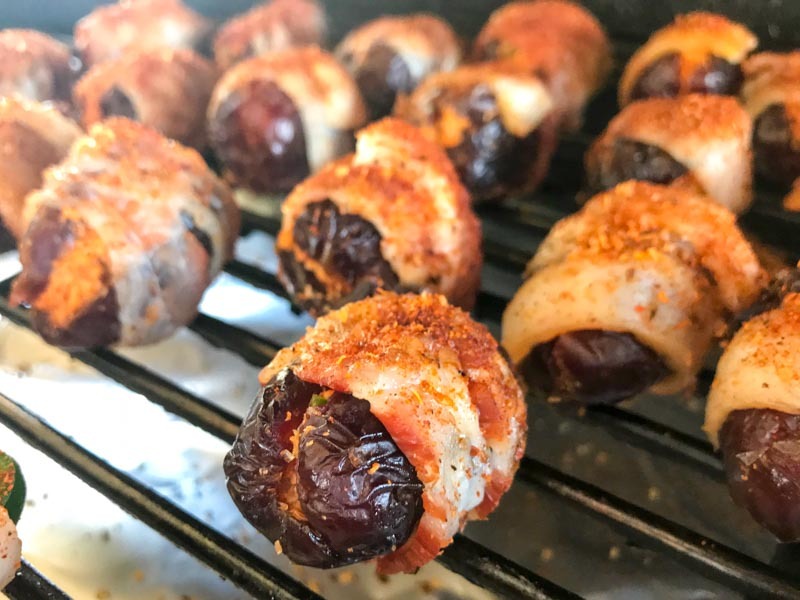 Now sit back, grab a ice cold IPA, and enjoy this recipe for Bacon Wrapped Dates aka Buddha Bites! The ingredients for this recipe couldn’t be any easier: bacon, jalapeno, Medjool dates, goat cheese, chorizo sausage, and Dizzy Dust . Slice the bacon in half and then down the middle length wise. Cook the chorizo and set aside to cool. Mix the chorizo, goat cheese, and diced jalapeno. Slice the dates and pull out the pits. Make little pockets so you can easily stuff them. Put a small dollop of the stuffing in each date (just enough so you can still close the date) then wrap in bacon. Sprinkle the Dizzy Dust all over the bacon. Set up your Big Green Egg for indirect cooking and stabilize the temp at 250. Add wood chunks. Once the smoke looks thin blue, add the dates and let them cook for 90 minute or until you see the bacon is crispy. Pull the Bacon Wrapped Dates aka Buddha Bites from the Big Green Egg and drizzle with honey. Serve and enjoy! This recipe for smoked dates stuffed with chorizo and goat cheese (aka Buddha Bites) is the perfect appetizer to make for your next get together.